I recently finished reading My Pantry by Alice Waters. I picked it up because I was curious about what she keeps on hand. It gives me a little thrill that we stock some of the same things—beans, tahini, yogurt, spice mixes (including za’atar, which I love sprinkled on fried eggs and greens). It’s unlikely that I’ll start saving apple cores as she does to make my own apple cider vinegar. But after my first season having a vegetable CSA last year, I’ve been collecting ideas for preserving, as well as for using stems and peels and scraps. I made pickles (cucumbers, using Bon Appetit’s brine recipe, and watermelon rind, which is surprisingly good with cheese on whole-grain crackers, and daikon radish). Also sauerkraut. There’s a gallon bag of carrot peels, leek greens, mushroom stems, and those leafy celery tops in my freezer that I’ve been using for stock. 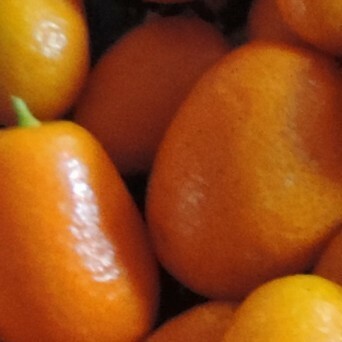 I owe it to myself to try Waters’ recipe for salt-preserved kumquats. Panko crumbs: Pan-fried chicken cutlets breaded with panko crumbs. It occurred to me after I made this that it is similar to the chicken schnitzel my mother used to make. Make cutlets from two large chicken breasts. Season to taste with salt and pepper. Beat an egg. Dip each cutlet into the egg, then dredge with panko crumbs. Fry in a neutral oil, such as grapeseed or canola, turning once. Keep warm in the oven until ready to serve. Potato rolls, chiles: Lucky Peach Lamb Burgers. In the fall, the CSA put out the last of the chile harvest in a “take all you want” bin. So I did. After a few months in a vacuum-sealed bag in the freezer, they’re too fragile to use raw, but they’re still perfect for cooking. I had the ground lamb in the freezer, too. Red lentils: Masoor Dal with rice. Half the recipe feeds 4-6. It’s less complicated than it looks. And it goes pretty quickly once you’ve made it a couple of times. I served it this time with the pickled watermelon rind in place of chutney. Pesto: Pesto Orechiette with Chicken Sausage. I can never find orechiette, but this recipe is good with any short pasta, (medium shells work well). Also with any Italian-style sausage. I used bulk turkey sausage. The ground meat isn’t pre-cooked, so I sauté it in step 2. This dish nearly finished off the stash of pesto that I made and froze back in September with basil from the CSA. If you have some extra red lentils, they’re great over a baked potato for lunch. (In fact, the first time I had Masoor Dal, before I knew what it was called, may have been at SpudULike, the British potato restaurant, when I was in college). If you have pesto leftover, spread some on top of a slice of cheese pizza.